Cast: Tony Mansker (Andy Lee/Mac), Jeffrey Pew (Billy Lawlor), Dorothy Stanley (Maggie Jones), Allen Kendall (Bert Barry), Johanna Schlitt (Ann Reilly (Anytime Annie)), Conor Guzmàn (Oscar), Julie Kavanagh (Peggy Sawyer), David Bonanno (Julian Marsh), Susan Haefner (Dorothy Brock), David Benoit (Abner Dillon), Mark Chmiel (Pat Denning/Doc), Spencer Kiely (Waiter), Dan Reardon (Waiter), Mickey Ryan (Thug), Devin Johnson (Thug). The movie 42nd Street came out in 1933 in the depths of the Great Depression when people were in need of a good dose of optimism and fun. 42nd Street delivered with four upbeat tunes by Harry Warren and Al Dubin, dance numbers choreographed by Busby Berkeley, and the story of a small-town, wide-eyed girl hoofer who comes to New York, gets a spot in the chorus of a new musical, then gets her big break and becomes a star. The play, first produced on Broadway in 1980, is also set in the '30s and adds eight more toe-tapping tunes by the same musical team of Warren and Dubin to go with the rousing tap dance numbers that frame the show. It was the first of its genre of backstage stories, and as such portrays the making of a musical extravaganza, complete with lavish costumes, exuberant production numbers, and multiple scene changes. The Weston's production hits the mark at every level. It's "grand, grand, grand" to see this kind of BIG theater masterfully produced on the Weston's intimate stage. Director Tim Fort, his production team, and cast of 23 grab the audience with the opening number and keep a firm grip on them for the entire evening. Julie Kavanagh emotionally and vocally captures the gee-whiz naiveté of the newcomer, Peggy Sawyer, and moves gracefully into the more mature performer who has begun to learn to lure her audience into the more sultry numbers. Her dancing is spirited and seems effortless, as do her physical comedic collisions and near-collisions. Dorothy Stanley is an entertaining self-assured, folksy, wise-cracking Maggie Jones, writer and performer for Pretty Lady, the play within the play. Jeffrey Pew, as the love interest Billy Lawlor, is charming, and thoroughly at ease with his beautiful tenor voice. The talented Susan Haefner is believable in the very difficult role of Dorothy Brock, the demanding diva who undercuts and then aids the newcomer. David Bonanno plays producer Julian Marsh with an appealing depth and calm authority. David Benoit, is delightfully diverting as Dorothy Brock's sugar daddy, Abner Dillon. Michael Raine's choreography is playful and stylish, with fun period touches such as a kiss behind a hat, and a number complete with top hat, tails, and a punctuating white-tipped cane. In one number his choreography successfully mimics Swan Lake, complete with demure downcast eyes and carefully placed arms and hands. Hats off to the ensemble, who execute the moves and the attitude throughout the production with great aplomb. Scenic Designer Howard C. Jones, makes remarkable use of the space. He employs multiple scrims, gauzy curtains, and various levels to produce a dozen distinct and effective locations, including the sleeper cars of a train, multiple dressing rooms, a hotel room, a cheerful restaurant, stages, and a rehearsal space. The set changes are integrated seamlessly into the action and lit expertly thanks to Lighting Designer Jack Mehler. The period costumes by Costume Designer Karen Ann Ledger, are marvelous. They capture the glamorous styles and colors of the 30s from sequined kick skirts to figure flattering traveling suits, complete with jauntily cocked little hats finishing the look. The contrast of street and rehearsal clothes to costumes for the scenes within Pretty Lady, including extravagant headdresses and colorful wide-skirted gowns, successfully set those scenes apart from the backstage story. 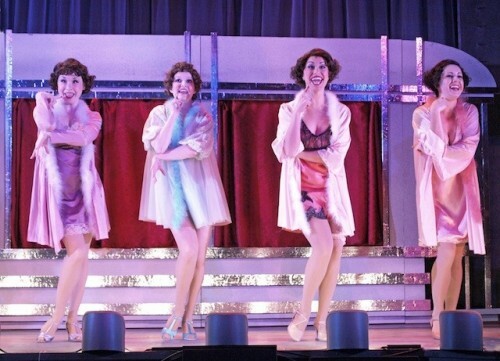 42nd Street is jam-packed with memorable musical numbers. 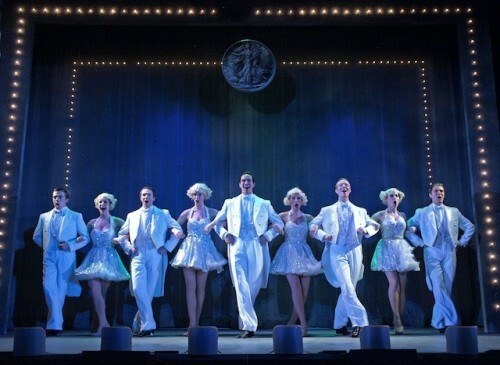 In addition to 42nd Street, you'll come home humming We're in the Money, Lullaby of Broadway, or Shuffle Off to Buffalo. Larry Pressgrove is credited as Music Director and for Orchestral Reduction for the Weston's production. He and four other musicians provide a full and lively accompaniment throughout the show. This is no small feat especially considering the fact that the playbill for the 2001 Broadway revival lists 23 musicians, a conductor, an associate conductor, and a music coordinator. No matter what the Fed says about the economy, most of us feel like we're still in the throes of the Great Recession and could do with a little cheering up. If you're in need of a good dose of optimism and fun, don't miss this splendid production at the Weston.